Happy Birthday norwich36 - hope you had a great one! 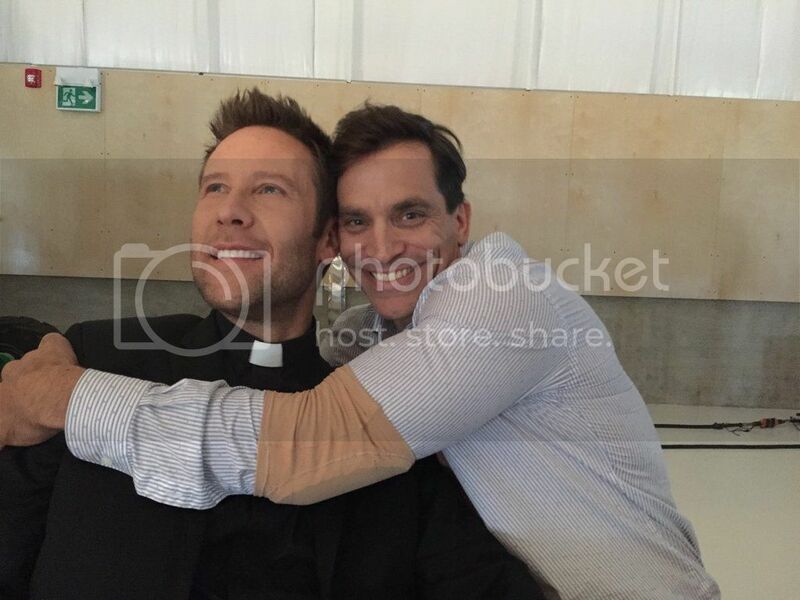 Johnathon Schaech is guest starring in S2 of Impastor. I adore this photo. Love it when men hug him. Did you see the pic of Mikey in his Adina wig and bra? Fortunately lots of men love to hug him! He looked so cute in his bra. And wow, those arms! I just watched an interview with Johnathon, and he seems like a sweet, thoughtful man, who has a deep appreciation for acting. There's a Tom connection here, too. Johnathon has the same trainer, and was in that workout video that Tom recently appeared in. I can't help but wonder if they talked about Michael. Johnathon has the same trainer, and was in that workout video that Tom recently appeared in. I can't help but wonder if they talked about Michael. Aw, that's nice! Six degrees of Wellingbaum. Michael is so used to it now, LOL. "Of course, there's an other guy draped over me."